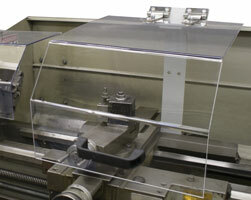 This line of heavy-duty lathe shields is designed for manual lathes or similar machines. The shield attaches directly to the backside of the carriage so it moves with the carriage as the workpiece is being machined. This provides a barrier between individuals and the point-of-operation hazard. The shield also deflects chips, coolant and other particles. The shield hinges back and rests at a 45 degree angle, making it easy to change the workpiece.